We now offer water service!! Would you like to do your part in keeping plastic out of the ocean? Do you like the tap water at home or office? Are you tired of paying for bottled water and lugging it home or work from the store? Do you have a water service but are tired of paying a fuel surcharge and invoice fee? Do you think our price may be better? If you answered yes to any of these questions you should call us! Click the Water Service Link above for more info. We know that you can purchase office and janitorial products anywhere these days. So why buy from us? First, we answer the phone. I know that sounds silly but when you call us, a human answers the phone and has the power to take care of any issue….right then. Second, do not let price cause you to buy elsewhere. Not only are our prices competitive, but we custom price products. If our price is higher than what you normally pay just let us know. Not only will we beat or meet that price but it stays on your account automatically for future purchases. 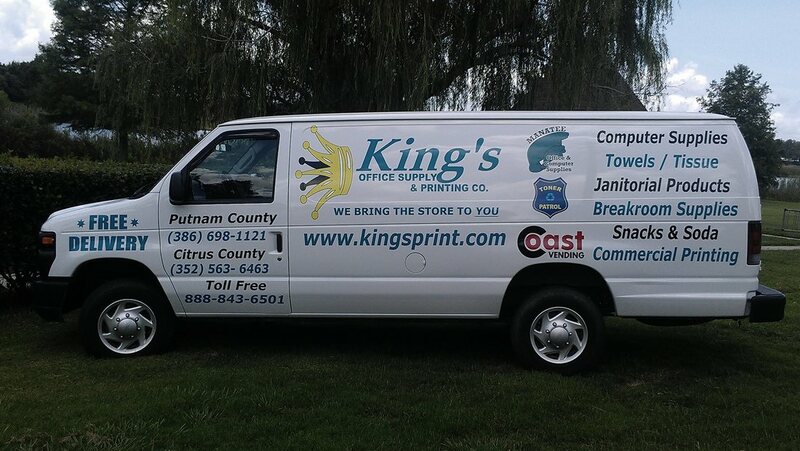 You do not need coupons, rewards or any other gimmick to get your best price from King’s. We do not mask your price buy charging you more when you only buy one like mail order companies. We don't have minimums and charge you more with no warning when you buy larger quantities. Third, Free delivery in our market areas. Orders are available for next day delivery in most markets. We don't deliver UPS or FED EX locally. Let us put away those heavy bulky items!! Not in our local area? We will ship items best way.....for free! Fourth, an invoice accompanies every delivery and you will receive an invoice via email. Pay by credit card? Our system will save your credit card number but don’t worry. Even I cannot get to your number or make an unauthorized purchase. Fifth is selection. We are your one stop shop. We have over 70,000 items. No more ordering from several locations or running to the store for items like coffee, hand soap and paper towels. Sixth, services. We are a printing company. We will save you money on items like checks and envelopes. Quotes are free. We have a water service, coffee service and vending machines. Seventh is Returns: Our return policy is the best in the industry. We accept returns for 30 days from invoice date, for any reason. Items must be re-sellable and be in original packaging. Simply call us and we pick up your return at no charge. For the safety of all our customers, returns are not allowed on food, beverages and all medical supplies. Eight is…..we are local. Money you spend with King’s stays right here to spent with you. To log in, shop and place orders, go to the "Order Office Products" page above. If you are one of our existing customers and don't have your log in credentials call us. If you are new to King's log in as a guest. The site is easy to navigate. Please do not hesitate to call with any questions 888-843-6501.